There is evidence of a settlement here from the Post Roman period. An extent for 1268 refers to the island by a Norse name – “Hasti Holm“. It is marked as “Cardigan Island” on Saxton’s 1578 map and on John Speed’s map of 1610. On 13th July 1717 the island formed part of the pre-nuptial settlement between William Lloyd of Lacques, Llansteffan, Carmarthenshire, and Anne Jenkins, spinster, of Cardigan. Anne Jenkins died in 1719 and the island reverted to her nephew, William Brigstocke of Blaenpant, Llandygwydd. On 22nd October 1736 Elizabeth Brigstocke mortgaged the island to John Evans of Penywenallt. The island is shown on Lewis Morris’ plan of ‘Cardigan Bay, Bar & Harbour’ of 1748. On 25th November 1844 Evan Jones of Aberporth, farmer, surrendered his lease on the 40 acre island to William Owen Brigstocke of Blaenpant. In 1859 the ketch ‘Morning Star’ was wrecked on the island on 25th October. On 1st June 1900 and in September 1905 the island was advertised to let as part of the Blaenpant estate. The same estate offered the island for sale on 16th February 1906. On 21st May 1920 W. M. Davies bought the island when it was sold off by the Blaenpant estate. 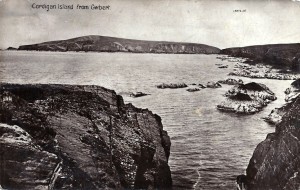 In September 1922 the island was advertised to let. In 1926 it was described as an uninhabited island of 35 acres. On 15th March 1934 the 17,000-ton Bibby liner, S. S. ‘Herefordshire’ was wrecked on the island with four men on board. She was bound for the Glasgow breakers and was under the tow of two tugs, when she broke free and struck the rocks. The four men were rescued from the island by breeches buoy. Rats also reached the island from the stricken vessel and killed off the thriving puffin colony. Hugh Ladd of Cardigan took charge of salvage sales. 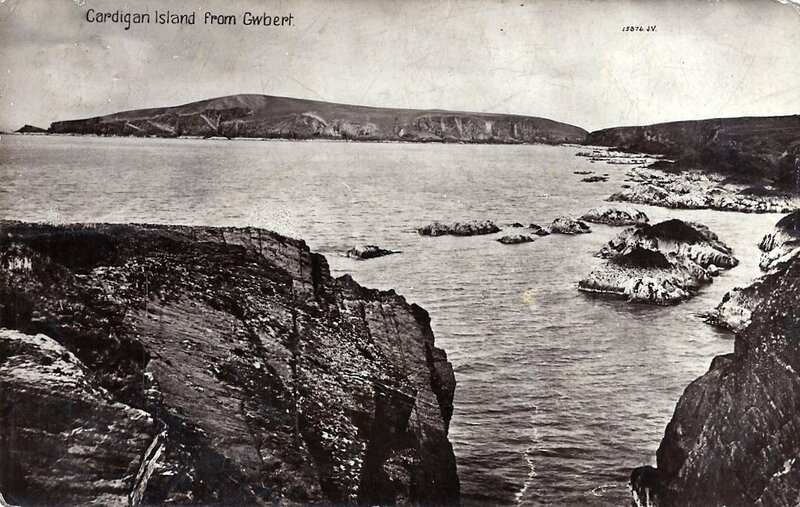 On 26th April 1944 The Pembrokeshire Bird Protection Society – affiliated with the R. S. P. B., leased the island for use as a bird sanctuary. On 22nd August 1952 and in November 1953 the island was advertised for sale. On 8th October 1971 “Viking” sheep, which had been here since 1943, were removed. An aerial photograph from January 1979 shows early mediaeval earthworks on the island. Welsh Shipwrecks Vol. 1, Tom Bennett 1981.